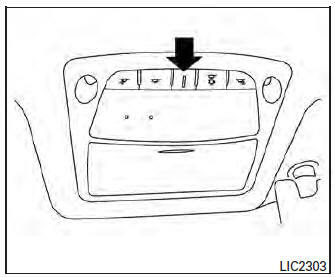 The doors are unlocked by the Intelligent Key, a key or the request switch (if so equipped) while all doors are closed and the ignition switch is in the OFF position. 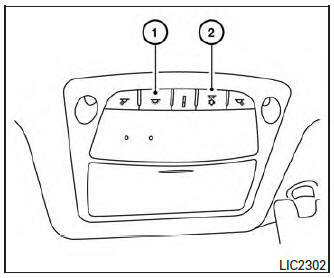 When the OFF switch 2 is pushed, the interior lights do not illuminate even when pushed. When the DOOR/OFF switch is pressed and the ON switch is pressed, all of the lights will come on. NOTE: The footwell lights and step lights illuminate when the driver and passenger doors are open regardless of the interior light switch position. These lights will turn off automatically after a period of time while doors are open to prevent the battery from becoming discharged. The console light brightness can be adjusted with the illumination brightness control.